Researchers at Chalmers University of Technology, Sweden, have developed a graphene assembled film that has over 60 percent higher thermal conductivity than graphite film – despite the fact that graphite simply consists of many layers of graphene. The graphene film shows great potential as a novel heat spreading material for form-factor driven electronics and other high power-driven systems. Until now, scientists in the graphene research community have assumed that graphene assembled film cannot have higher thermal conductivity than graphite film. 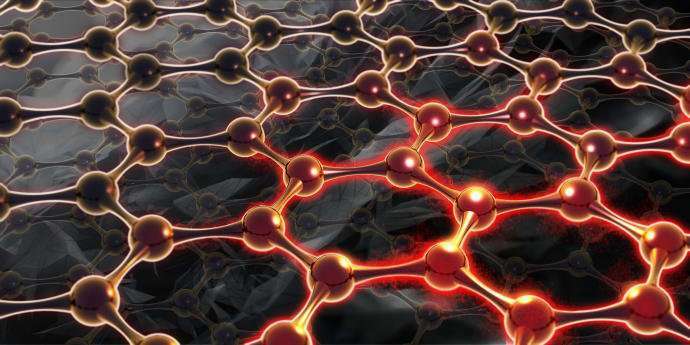 Single layer graphene has a thermal conductivity between 3500 and 5000 W/mK. If you put two graphene layers together, then it theoretically becomes graphite, as graphene is only one layer of graphite. Today, graphite films, which are practically useful for heat dissipation and spreading in mobile phones and other power devices, have a thermal conductivity of up to 1950 W/mK. Therefore, the graphene-assembled film should not have higher thermal conductivity than this. Research scientists at Chalmers University of Technology have recently changed this situation. They discovered that the thermal conductivity of graphene assembled film can reach up to 3200 W/mK, which is over 60 percent higher than the best graphite films. Professor Johan Liu and his research team have done this through careful control of both grain size and the stacking orders of graphene layers. The high thermal conductivity is a result of large grain size, high flatness, and weak interlayer binding energy of the graphene layers. With these important features, phonons, whose movement and vibration determine the thermal performance, can move faster in the graphene layers rather than interact between the layers, thereby leading to higher thermal conductivity. "This is indeed a great scientific break-through, and it can have a large impact on the transformation of the existing graphite film manufacturing industry", says Johan Liu. Furthermore, the researchers discovered that the graphene film has almost three times higher mechanical tensile strength than graphite film, reaching 70 MPa. "With the advantages of ultra-high thermal conductivity, and thin, flexible, and robust structures, the developed graphene film shows great potential as a novel heat spreading material for thermal management of form-factor driven electronics and other high power-driven systems", says Johan Liu. As a consequence of never-ending miniaturisation and integration, the performance and reliability of modern electronic devices and many other high-power systems are greatly threatened by severe thermal dissipation issues. "To address the problem, heat spreading materials must get better properties when it comes to thermal conductivity, thickness, flexibility and robustness, to match the complex and highly integrated nature of power systems", says Johan Liu. "Commercially available thermal conductivity materials, like copper, aluminum, and artificial graphite film, will no longer meet and satisfy these demands." The IP of the high-quality manufacturing process for the graphene film belongs to SHT Smart High Tech AB, a spin-off company from Chalmers, which is going to focus on the commercialisation of the technology. The manufacturing method of the graphene film is based on simultaneous graphene oxide film formation and reduction, on aluminum substrate, dry-bubbling film separation, followed by high-temperature treatment as well as mechanical pressing. These conditions enable the formation of the graphene film with large grain size, good atomic alignment, thin-film structure, and low interlayer binding energy. All these features have great benefit for the transfer of both high-frequency diffusive phonons and low-frequency ballistic phonons, and thereby lead to the improvement of in-plane thermal conductivity of the graphene film. Phonons are quantum particles that describe the thermal conductivity of a material. The paper, "Tailoring the Thermal and Mechanical Properties of Graphene Film by Structural Engineering," is published online in the scientific journal Small. Paper towels are just a mash of connected fibers, but you can vastly increase its ability to absorb water by simply folding it in half which gives a large increase in interstitial space. I wonder if a related phenomena is going on here?